15 AMAZING ‘Shirt Jackets’ You Can Wear With ANY Outfit! Shackets are all the rage right now. 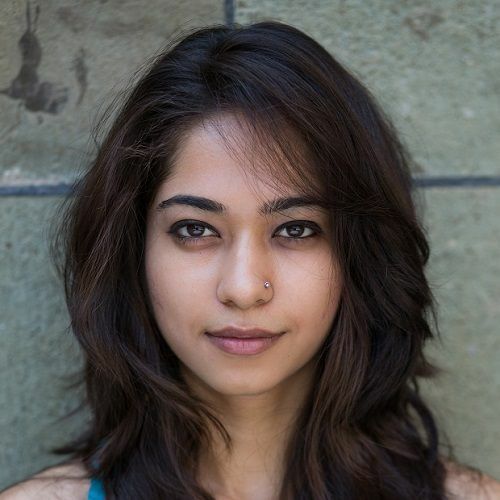 We’ve spotted all the young celebrities of Bollywood sport the trend and we can’t wait to try it! Wait, not too sure what a shacket is? A shirt, a jacket - basically a shirt that can double up as a jacket! These shirt jackets make for a pretty cool and comfortable airport outfit or even a casual day in college. Which is why we put together 15 amazing shirt jackets just for you! They can be worn on their own or layered over a cute outfit. Go grab these now!! Think a basic denim shirt is too mainstream? Try this one with sleeves with roll up tabs instead! Add a summery vibe to any outfit with this easy breezy shirt. We love! Price: Rs 749. Buy it here. This checked shirt is a good pick for a casual day in college. Wear it with over a crop top and high waisted jeans and we bet this’ll be the only outfit you’ll want to wear this season! Price: Rs 746. Buy it here. A denim shirt is a must have in every girl’s closet. If you don’t already own one, this slogan shirt is a trendy piece you should totally invest in! 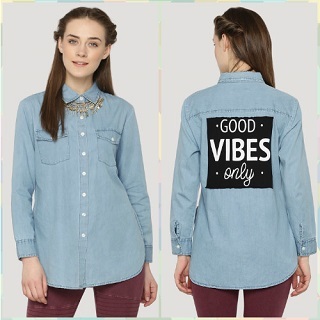 This denim top will ensure you make a statement wherever you go! Price: Rs 1,090. Buy it here. If your outfit is rather simple, add a pop of colour to it by teaming it up with this red shirt jacket. The loose fit will add a comfortable yet stylish vibe to your look. We love it! Price: Rs 699. Buy it here. 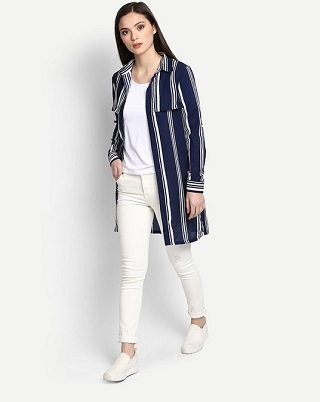 How cool is this navy blue striped shirt jacket? It has the power to make any outfit look polished. Wear it with a white t-shirt and denims to make this a head turning combination! This shirt jacket is for every girl who likes to make a subtle statement. 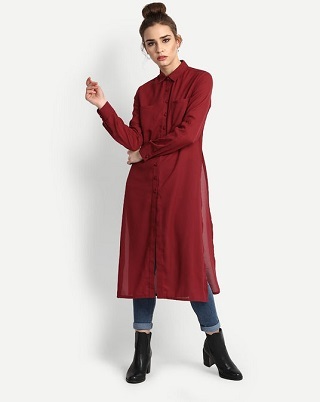 On days when you really can’t decide what to wear but want to keep it stylish anyway, wear this burgundy shirt over any top and you’re good to go! Price: Rs 1,299. Buy it here. 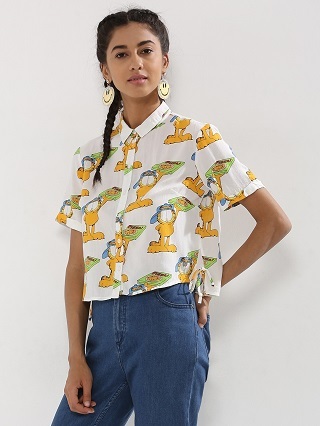 We just found the perfect shirt for every girl who wants to add a quirky element to her attire. This one with garfield and pizzas is such an adorable pick! Wear it with boyfriend jeans and a contrast vest to make it a winning look! Price: Rs 1,799. Buy it here. 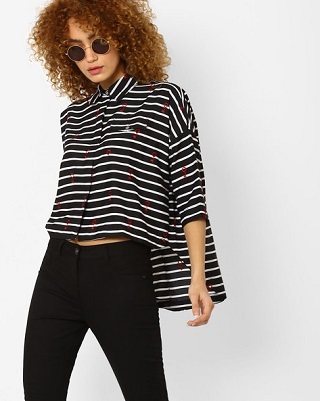 The basic monochrome shirt just got a quirky twist! This high low shirt is a unique pick we bet you can’t resist. Wear it with shorts or a pair of denims for an offbeat yet comfortable look. Price: Rs 699. Buy it here. 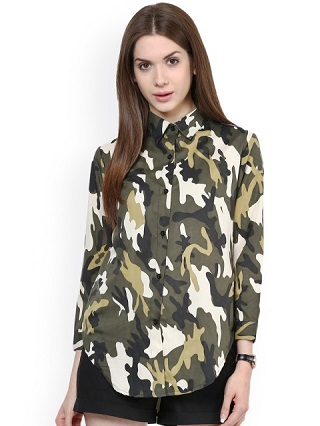 What better than a military print shirt to amp up your style quotient? A plain white tee, black denims and plimsolls are all you need to nail the look! A basic black shirt that goes with all your outfits is a must have in your closet. 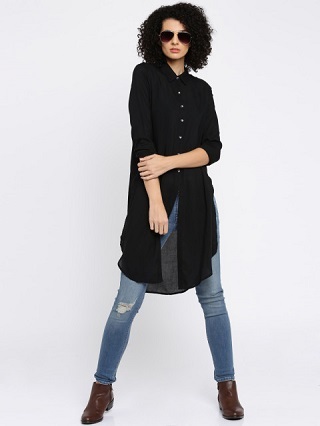 Look all shades of cool in this black shirt that exudes a comfortable vibe and will make any outfit look summer ready! Price: Rs 1,399. Buy it here. 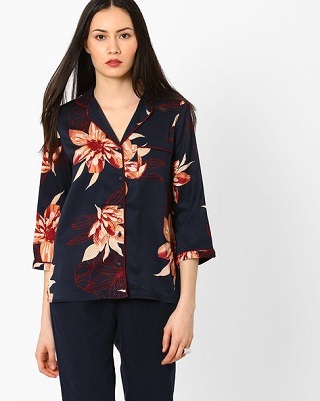 This navy blue floral shirt will make anything you wear look feminine and oh-so-glamorous! Team it with a matching top and cigarette pants to nail summertime chic in no time. Price: Rs 1,899. Buy it here. Animal prints, anyone? This animal printed shirt is high on style and can be easily worn for parties as well. Wear it with minimal accessories, plain bottoms and let this shacket do the talking, girl! Price: Rs 1,751. Buy it here. A flannel shirt will forever come to your rescue when you have nothing to wear! Give any basic tee with jeans outfit a stylish twist by teaming it with a flannel shirt. 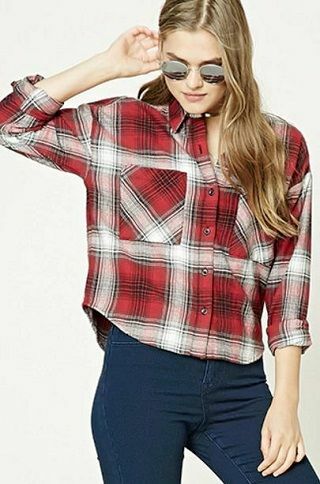 This boxy flannel shirt is a trendy one you wouldn’t mind investing in. Price: Rs 1,399. Buy it here. Up your glam game in seconds with this pink shirt. 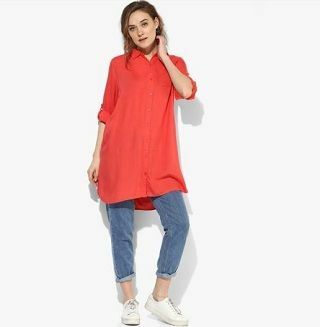 For the days when you’re not waxed, use this as a cover up over any sleeveless top! What’s not to like in a girly floral shirt like this one? The high low design and the subtle prints make this the perfect summer add on. Strappy sandals and well fitted pants are all you need to make this look work! Price: Rs 1,199. Buy it here. Don’t you just love them all?